Today is RELEASE DAY for all of the new AUGUST products at C.C. 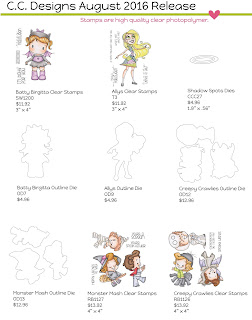 Designs!! 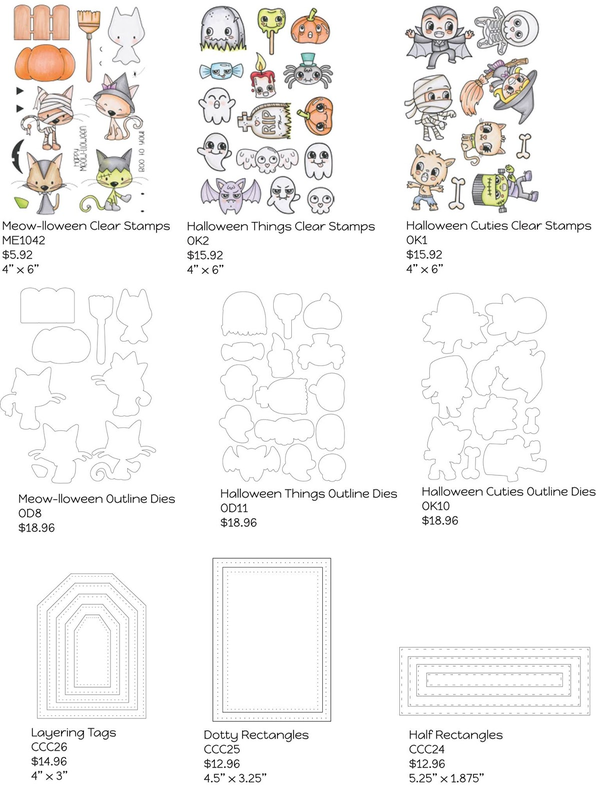 As you have seen from our Preview Days, all of the new stamps and dies are SPOOKTACULAR, and perfect for all of your upcoming Halloween projects! 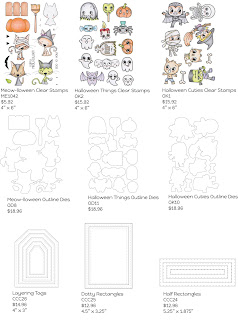 For the month of August, we have 7 character stamp sets with coordinating dies available for purchase, Layering Tags Die, Dotted Rectangles Die, Half Rectangles Die, and Shadow Spots Die. For my dt project I made a card using scary cats from Meow-lloween clear stamp set. hehe I loveeee cats and this set is perfect for all cat lovers. I also used the outline dies to cut out the kitties. Sentiment is an old one from last year's Halloween release. I cut it out using the new Half rectangles. Every release we will have a New Release Blog Hop to showcase our awesome Design Team! Check out their amazing creations! Leave a comment on each DT Member’s Blog, and then head back to the C.C. Designs Blog to let us know you completed the hop. *This Blog Hop will end on Sunday, August 7th at NOON, 12pm EST. Winners will be announced the following week. Don't forget to also comment on each CCD PREVIEW DAY Post for a chance at winning a $15 CCD Store Gift Certificate. Love these cute kitties on your adorable card! Great coloring and details! The Meow-lloween set is a fave! Great images. They are so cute. Love this card and the matching dies. Purr-fect. Eeeek! Super sweet kitty card!! Lovely card. thos scary kittens are super cute! your coloring is as always amazing! The kitties are cute all dressed up!! I just adore this release and I love your card! Can you please tell me where you got the corner cobweb die? You had me at Meow... LOVE those halloween kitties!